I just couldn’t resist. I’m not sure why all the schools I’ve ever worked in so totally embraced Valentine’s Day, but they have. (I suspect it may be because I’ve always worked in areas with cold winters and by February we’re all pretty stir crazy, but be that as it may….) Here is an assortment of Valentine’s Day possibilities for flexible thinking ranging from genuine reinforcement of content to a few for those times when you just need to concede the moment. Have fun! Create valentines from one fictional character to another. What valentine would Frog send Toad? Romeo send Juliet? This activity rises to the level of literary analysis and metaphor if you require explanation. What three key characteristics of Romeo can be seen in the valentine? Write an essay in which another organ of the body argues why it should be the symbol of love rather than the heart. It must argue based on its actual function. Create a valentine to or from virtually anything being studied. What is there to love about an electron? A lever? A mammal? A fraction? 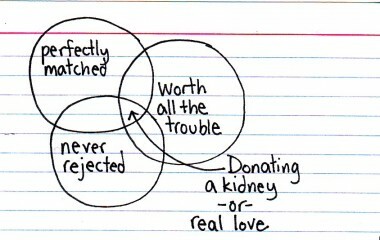 Make valentines using Venn diagrams, maybe like this from a math-minded friend. 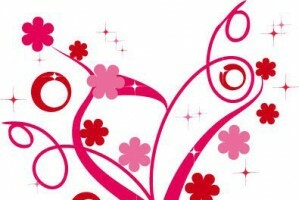 Or create graphs with valentine themes. How would you graph the relationship between number of friends and number of valentines received? Would the graph change across grade levels? If so, how could you show that on one graph? What kind of scatterplot would represent the relationship between number of Facebook friends and number of valentines? Have students create graphs and explain why theirs is appropriate. Or be more abstract. How about a graph of the relationship between love and trust? What animal is most like love? This is not, needless to say, the same as the animal you love the most. I might love my cats but think they are too demanding to represent love. (Or maybe love is demanding. I need to think about that.) Have students explain why they chose that animal. For older students, continue by thinking about other characteristics of the animal and see if they can lead to additional insights into the nature of love. Try some Substitution (see SCAMPER under the Teaching Creative Thinking tab). Take a popular phrase from advertising or a common saying and turn it into a possible valentine. In Michigan there is lots of conversation about Chrysler’s Super Bowl ad in which Clint Eastwood said,” It’s halftime in America.” (Yes, I know there is controversy, too, but I think it’s silly.) Someone could create a valentine that says, “It’s halftime in [fill in your city] and I want to spend the second half with you.” To minimize issues with double entendre, you might want to provide the list of potential ads. And have a teen check them! Create a valentine from one historical character to another. These need not be romantic valentines, simply messages of appreciation (or lack of appreciation, I suppose). What valentine might Roosevelt have sent to Churchill? Henry VIII to his various wives?? How about John to Abigail Adams? This might be a nice chance to share some of their actual correspondence. Invent a new (probably imaginary) candy treat for Valentine’s Day. Design a marketing campaign to sell it. Create a drawing, painting, or collage about friendship. This can be a good chance to discuss visual metaphors and symbolism. What would friendship look like if you can’t draw a friend? The project also provides a chance to discuss the fact that good friends are great gifts. This may be at least slightly helpful to those who are mourning their lack of a candy-bearing special someone. What will you do to ensure a creativity-filled Valentine’s Day? Ooh…I like this, you’ve shared very clever and fun ideas! I especially [heart] the body part argue Valentine. 1) Create a Valentines Board Game. Switch games with classmates and play each other’s games. 2) Write a Valentine skit using characters currently studied in social studies or famous civil rights leaders. 3)Create a Valentine timeline, researching the history of Valentine’s. Match up your own family time line with the Valentine timeline for a full scale timeline of love. 4)Design a Valentine menu. Have students turn the room into a French bistro, complete with table cloths and nice napkins. Add the decorated menus to the tables. Have the students cut, chop, and cook items on the menu to serve at the bistro to one another (or to invited parents and guests). This would be fun to do at home with the kids too!